The China-US relationship, though it is impossible to go back to what it was 40 years ago due to the drastic change in overall strengths between the two, can still progress and avoid worsening into a "modern Cold War," Chinese experts said on Tuesday, which marked the 40th anniversary of the establishment of China-US diplomatic relations. Leaders from both countries exchanged good wishes on the anniversary. Chinese President Xi Jinping, in his congratulatory message, said that China-US relations have experienced ups and downs and made historic progress over the past 40 years, bringing huge benefits to the two peoples and contributing greatly to world peace, stability and prosperity, while noting that history has proven that cooperation is the best choice for both sides, Xinhua News Agency reported. 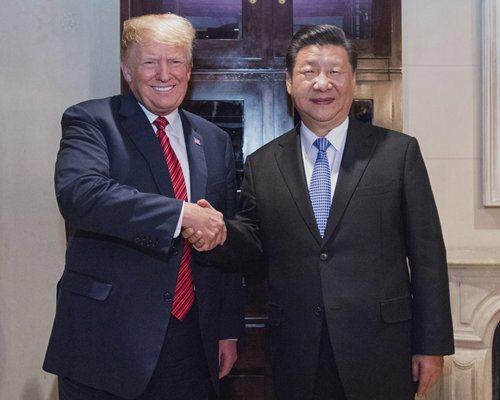 For his part, US President Donald Trump said it is his priority to promote cooperative and constructive US-China relations, adding that his solid friendship with President Xi has laid a firm foundation for the great achievements of the two countries in coming years. The 40th anniversary of the establishment of China-US diplomatic relations, came amid a temporary 90-day trade truce coming from the consensus reached by the presidents of the two countries on the sidelines of the recent G20 summit in Argentina in December 2018, where the two leaders agreed not to further escalate tariffs and to step up negotiations toward the removal of all additional tariffs. Before the truce agreement, Washington had already put tariffs on $250 billion in Chinese goods to which Beijing responded by slapping tariffs on $110 billion in US goods targeting politically important industries such as agriculture. Against such backdrop, Former US president Jimmy Carter - who normalized bilateral relations with then Chinese leader Deng Xiaoping, putting an end to three decades of hostility in January 1979 - warned of risks of sliding into a "modern Cold War" with China in his opinion piece published in the Washington Post on Monday. Carter voiced his concerns in the article that elites from both countries were increasingly describing each other as threats, and wrote, "If top government officials embrace these dangerous notions, a modern Cold War between our two nations is not inconceivable." However, Chinese scholars reached by the Global Times, largely dismissed such Cold War-related fears, saying although bilateral ties cannot return to what they once were 4 decades ago due to the rapid development of China in overall national strength, it is unlikely the world will witness another US-Soviet Union-like rivalry in coming years. "A new Cold War is not in line with China's interests, and as China enhances its socioeconomic and military strengths, China is now strong enough to play as much of a deciding role as the US in defining the bilateral ties. Therefore, China will not let that happen," Li Haidong, a professor at the Beijing-based China Foreign Affairs University, told the Global Times on Tuesday. Also, Ni Feng, deputy director of the Chinese Academy of Social Sciences' Institute of American Studies, said that "China is nothing like the Soviet Union, as it has entirely integrated into the global economy, and is one of the most important players and supporters in the system." "Unlike the Cold War, the overwhelming majority of both Chinese and American people, in fact, are greatly fond of each other, and admire each other's culture, and this shall play a stabilizing role in the bilateral relationship development and even stop policymakers from making decisions to make the other as an enemy," Ni noted. According to the People's Daily in January 2017, on average, there were 14,000 people traveling between the countries daily, and flights connecting the two countries took off and touched down every 17 minutes in 2016. And there are 350,755 Chinese students enrolled in US universities in 2018, accounting for 32.5 percent of the total 1.08 million international students in the US, according to a report issued by the Institute of International Education (IIE). "China and the US are so interwoven in all aspects of life, in one of the most remarkable achievements made in the past four decades," Li said. Lu Kang, China's Foreign Ministry spokesperson said on Sunday, that in 2017 over 5.3 million visits were made between the two sides, while the number forty years ago was only several thousand. Also, bilateral trade volume surpassed $580 billion in 2017, from what was only 2.5 billion four decades ago. Lu also provided the data that forty years ago, two-way investment between China and the US was almost zero, whereas in 2017, two-way investment in various forms amounted to over $230 billion in accumulative terms. Constructive progress could be further made in bilateral relationship development, as there has already been plenty of common ground found and crisis control mechanisms over issues like the Taiwan Question have also been recognized, Chinese observers noted as reasons to hold optimism for the future of the bilateral ties. The US will need China's coordination and cooperation in many fields such as contributing to curb climate change, fighting against terrorism and extremism, let alone what worries the US the most, the denuclearization of the Korean Peninsula, Ni said.